If you thought that North Carolina’s claim to aviation fame is limited to “having provided a patch of sand in a remote corner of the state” for the Wright brothers’ three-year experiments with gliders on the dunes at Kill Devil Hills near Kitty Hawk that finally resulted in their famous fully controllable powered flight in 1903, you’d be far from alone. For a long time, the author (b. 1932) obviously knew no better either, a discovery that bothered him, a professional and award-winning regional historian, mightily. It was only after retiring in 1992 that he pulled the material for this book together. For three decades he had taught history at Meredith College; for half that time his books were adopted as state history texts in North Carolina’s public schools. It took eight years of interviews and sifting through thousands of fragmented public and private records to get the book done just in time, in time for the centennial of flight celebration scheduled for 2003—which happened to precede his death of a long illness by only a few weeks. What a pity that he didn’t get to taste the rewards for having connected so many dots. As the reason for traditional history text overlooking this topic he suggests that, in contrast to other transportation sectors, aviation was simply never recorded properly, consistently, on in one place. Even if this is true, it explains only the how and not the why. North Carolina as a state was obviously keen on staking out its turf and finding something worthy in its history to make it “first” in something, anything. Witness the 1975 “First In Freedom” license plate slogan that proved to be so controversial (although the first state to declare independence from England it had been undeniably late in granting certain freedoms and equality to certain of its citizens) that the U.S. Supreme Court ruled that offended citizens had to be allowed to tape it over. In 1982, North Carolina changed the slogan to “First in Flight”—without knowing even then all the legitimate firsts the state could claim: beginning 30 years before the Wrights, Tar Heels had tried their hand at designing aircraft powered by hand, steam, clockwork, electricity, and gasoline. They had built gliders, monoplanes, biplanes, seaplanes, helicopters, and dirigibles. The first woman to parachute from a plane, the inventor of the rip chord, the first woman’s endurance flight record, the first African American to design a plane or patent an antiaircraft gun. And those are just some of the examples! To be sure, not all of these ideas worked, nor were they necessarily the best, or the first, or the only but they do manifest independent thought. It does seem a stretch though to imply that without North Carolinians, the airplane would have been invented in Europe. This notion is certainly an undercurrent here but it does not diminish the veracity of Parramore’s bigger point: that the state has been ignorant of aspects of its history. 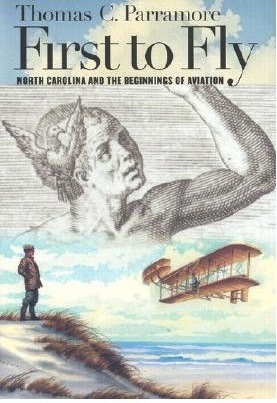 He even sifts through works of fiction for evidence of aviation firsts attributed to North Carolina. Lest anyone doubts his findings, he offers 30 pages of Chapter Notes, a 10-page Bibliography, and an Index of staggering depth. His prose too has an uncommon depth, fluidity, and fullness of thought that make the book a joy to read. The focus is on the half century from 1873 to 1923 but the thread is followed back all the way to 16th century tales of local Native American conjurers who claimed to be able to fly, which, while surely not true, do show that flight is a fundamental yearning. 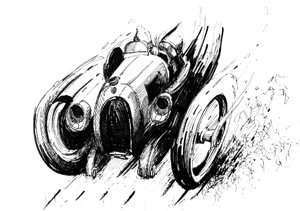 From a 1910 flying pig cartoon (moaning about the cost of bacon) to design proposals for flying wings to a good selection of period photos the book makes a solid case that should cause aviation folk to rethink their lexicon of reference points and will also delight the regional reader with an interest in local history of any stripe.